For ELAC, 39 percent of the money from the budget is going to certified salaries, 17 percent to non-certified salaries and 21 percent to benefits. This means 77 percent of the overall budget goes to cover staff and their benefits. 10 percent goes to operating expenses such as gas, telephone and electric utilities. The rest, one percent, goes to other smaller expenses such as printing and supplies. The current certified salaries budget is set at $48.41 million. That’s nearly $13 million less than last year’s year end expenses for certified salaries. 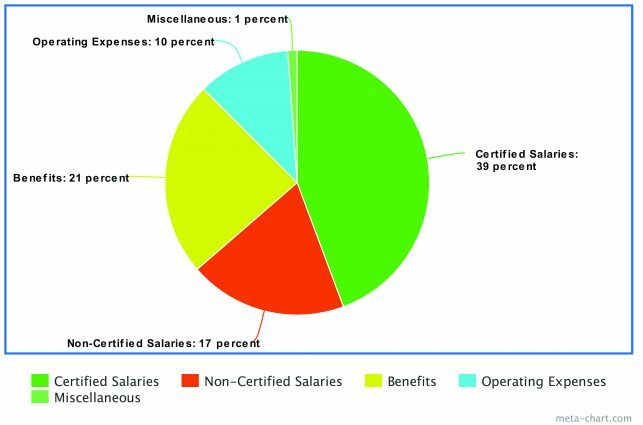 The highest cost for certified salaries is for regular instructors with the current budget being set at $23.78 million. This is approximately the same as what it was for the year end budget last year, with the total cost of that being more than $23 million. The highest cost for operating expenses is contracting work, with the final budget being set to $9.32 million for 2018. This is an increase of nearly twice as much from last year, with the final budget for last year being set to $4.82 million. The second highest operating expense is electricity, with the budget being set at $3 million. That’s an increase of about a million from last year. The total year end budget for last year was $124.56 million. The total year end expenses came out to $121.67 million. The current budget for this year is set at $122.98 million. As of October, the expenses so far for this year are $34 million.